This week’s haftorah teaches us the importance of praising Hashem in song. Hashem must be very pleased with the women of Midreshet B’erot Bat Ayin who praised Him profusely in our musical hallel on Rosh Chodesh Adar. 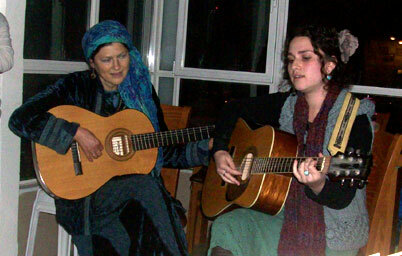 We are thankful to Chaya Fogelman for her joining us monthly to lead our hallel with her unbelievable soulful voice. Just as this week’s Torah portion Vayikra is all about the sacrifices, this week's haftorah centers around the importance of the Temple's sacrificial service. The prophet Yesha’yahu rebukes the Israelites for turning to idol worship instead of offering sacrifices. After having rebuked the Israelites profusely for neglecting Hashem’s service, the prophet changers gears and begins to address the Jewish people with love and affection. This teaches us that no matter how far we have gone away from Hashem, and no matter how much rebuke we receive, in the end, Hashem promises to forgive us, bless us, and bestow prophesy upon us once again. “As I will pour water on the thirsty and running water on dry land, I will pour My spirit on your seed and My blessing on your offspring. They shall sprout among the grass like willows on rivulets of water” (Yesha’yahu 44:3-4). Hashem promises to fulfill our thirst for the lost waters of prophecy. Just as Parashat Vayikra testifies to the prophecy that Moshe received in the Mishkan (Tabernacle), this week’s haftorah assures Israel that we will once again merit the word of Hashem. Our eternal relationship with Hashem can never be broken. Hashem will reestablish his loving relationship with us, and when the time is right, His prophecy will become a daily experience. Even after all we have done against Hashem, He remains right there waiting for us. Our haftorah opens by stating the purpose of the creation of the Jewish people: “This people I formed for Myself; they shall recite My praise” (Yesha’yahu 43:21). Rashi reiterates, “I formed this people for Myself, in order that they shall recite My praise.” Radak adds, that the children of Israel must praise Hashem for the miracles that He will perform, when He takes us out of exile. “As the wind blows away the clouds so will I erase your rebellious acts and unintentional sins. Return to me for I have redeemed you” (Yesha’yahu 44:22).Malbim (ad loc) explains that as far as Hashem is concerned our redemption already happened; all that remains is for us to repent and praise Hashem for His miracles. On verse 43:21 Malbim clarifies that it is not enough to give honor to Hashem. Rather, the Jewish people are created specifically in order to praise Hashem, for only we have the ability to grasp the great benefit of Hashem’s endeavors for our sake. This recognition will inspire us to praise Hashem and tell the world about the greatness of His deeds. Reading this verse with its commentaries, made me realize at my core, that our entire raison d’etre is really only to praise Hashem, wow! Nothing else that I do during the day, like checking my email, cleaning, gardening, taking care of my chickens, food preparations, or even preparing Torah classes is as important as simply praising Hashem, for this I am created! Baruch Hashem, today as well as yesterday, in honor of Rosh Chodesh, I was able to recite Hallel. However, it is not every Rosh Chodesh that I manage to praise Hashem in Hallel. Sometimes it happens that I find myself “too busy” to recite Hallel. There is never a lack of things that needs to get done, and reciting Hallel sometimes keeps being pushed off, until all of a sudden the sun goes down and the opportunity is lost. Rabbi Dovid Siegel quotes Chazal (our Sages) who explain that we exert enormous energies throughout the day in pursuit of self advancement; however, we are unwilling to exert even minimal energy for the sake of Hashem. We return home after a long tiresome day at work and neglect praying with the “valid” excuse that we are too tired. Why did we not include Hashem in our plans? Why did we spend our energies on everything besides serving Hashem, the purpose for which we were created? There is a spiritual law that the greater the importance of a matter, the greater the resistance in attempting to prevent us from carrying it out. I find myself struggling with the yetzer hara (negative impulse) daily when it comes to praising Hashem. Are Only Men Created for the Sake of Praising Hashem? When I finally settle down to pray, after all the “important matters” are taken care of, I can’t wait to get to the personal requests in the tefilah. Yet, while reciting Hashem’s praises, it’s hard to focus my mind. Although women are exempted from reciting Hallel on Rosh Chodesh and during the holidays since it is a positive time-bound mitzvah (Biur Halacha, Orach Chaim, Siman 422), it seems to me, that if we are created in order to praise Hashem, then we should still make the effort. In the past, when women had to go down to the well to draw water, wash the garments by hand, grind their own flour, and dig up their own potatoes, it is understandable why they should be exempt from reciting Hallel. Today, with washing-machines, disposable diapers, food-processors and pre-checked greens, women have much less of an excuse to refrain from prayer. Especially on Rosh Chodesh, when women are accustomed to abstain from work (Shulchan Aruch, Orach Chaim 417) it seems to me, that we should prioritize praising Hashem by reciting Hallel. Reciting Hallel, is actually considered a minhag (custom) even for men. So just as men have taking this custom upon themselves and are strict about reciting Hallel on Rosh Chodesh, why should women do any less? Aren’t women also created for the sake of praising Hashem? The haftorah concludes by urging both men and women to praise Hashem: “Sing, you heavens, for Hashem has done [this], shout, you lowest parts of the earth; you mountains, burst out in song, the forest and all trees therein; for Hashem has redeemed Ya’acov, and with Israel shall He be glorified (Yesha’yahu 44:23). It is known that the heavens are a metaphor for the masculine principle, while the earth (mother-earth) represents the feminine. Likewise, Ya’acov refers to the Jewish women, while Israel refers to the men (Rashi, Shemot 19:2). Thus the prophet encourages both men and women to burst out in songs of Hashem’s praises. Let us remember the purpose of our existence and continually find new ways to recite Hashem’s praises!